As you well know, the past few years have been a very special time for the Philadelphia Phillies and its loyal fanbase. Four division titles, three trips to the NLCS, two National League Pennants, and a World Series ring is the type of remarkable success that has not been common place in this city? Every game is a playoff atmosphere with standing room only crowds filling arguably the best venue in all of sports. Baseball pundits and fans have debated whether this is the best era in team history— or even in Philly sports altogether. The "dynasty" word was being tossed around pretty freely, but regrettably has been shelved for now with the Phillies premature postseason exit this year. I think you could both agree that the Phillies still have some unfinished business. Ruben, it surely won't help the cause if Jayson is wearing a different uniform next season. Some argue that top prospect Domonic Brown is waiting in the wings, and that this is part of baseball's natural order. Although he showed some flashes, Brown's three-month tour with the big club highlighted that he's probably not quite ready for prime time. And importantly, he swings from the left-side. After the way the Giants lined up lefties in the NLCS to shut down the Phillies left leaning lineup, tipping the scales further in that direction clearly wouldn't improve the team's championship aspirations. Left field in 2012 sounds just about right. A lineup with Brown replacing Jayson in 2011 would likely have Charlie Manuel asking for volunteers to move to the right-side to balance things out like a US Airways Express flight attendant. Besides providing an important right-handed threat amongst the left-handed sluggers, Jayson contributes to winning in so many other ways. His athleticism, instincts and rocket-launcher arm make him one of the best right-fielders in baseball. He gets on base a lot, and then possesses the speed, aggressiveness, and hustle to freely move around them. Did I mention that Jayson is the National League's all-time postseason leader in home runs? For a team setting its annual goal to win it all, isn't having proven big game performers critically important? He is a true gamer whose total contributions sometimes only show up on the stat sheets in the win column. Additionally, keying in on a non-Sabermetric stat, he ranks very high in "cool" factor. Jayson had it right when he said a few weeks ago, "Why mess with a winning formula?" And, Jayson, it is very doubtful that you can replicate the electric atmosphere of Citizen's Bank Park, not to mention the tremendous camaraderie and chemistry with your teammates. Speaking of the baseball stadium, wouldn't you agree that it is pretty much ideal for a player of your skills? You are a perfect fit for this club and this city. And they are a perfect fit for you. Why would you want to mess with a winning formula? Why not choose to remain as a key component of something very special that will be recognized in this town for generations to come? You will be financially set for life with your next contract— here or elsewhere. 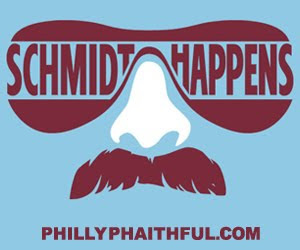 Why accept anything less than the ideal situation— namely Philadelphia. I suspect the past few years have been among, if not the best times in your life. Why walk away from more of the same for a little extra money? Wouldn't you miss all your close friends in The Bank's right field bleachers? Why risk a case of writer's cramp sending out postcards to stay in touch? Let's face it, Ruben and Jayson, you need each other. And, Phillies teammates and fans need you to need each other. So, how can we work this out? Jayson, although it might not be in your agent's DNA, perhaps you could whisper in his ear to negotiate nicely with the Phillies because they are like family. Tell him that RAJ didn't really intend to make you look bad when he mentioned that RISP stuff. After all, didn't the Phillies take a risk on you when others wouldn't and then provide the perfect surroundings for you to flourish? That sounds like family to me. And, how about telling that agent you're up for a hometown discount? Ruben, think about how difficult it would be to fill the gaping hole in the lineup and in right when it comes time to negotiate. Remember, too, there's nothing wrong with being creative. A trade here, a future expiring contract there, a deferred payment here, an advertising rate bump there— and you might be able to sell it up the line. Consider also that Jayson had something to do with those 100-plus consecutive sellouts. Fans are willing to pay to see winning teams, especially those comprised of winning, likable players with a work ethic. He's not going to come cheap, but isn't he worth it? (Or, if you prefer, Werth it?) Proven five-tool players are hard to come by— lets not let him go the way of Cliff Lee. Surely, seeing the Giants players dancing on the field last week has to make both of you want to take another crack at getting it right next year. Heck, a few more rings could fit on those hands, so why stop there? Can't we do this together? Lets finish business the way it was intended. Random rants, thoughts, and observations. Has Pat Burrell officially worn out his welcome in Philadelphia with his expletive-laced rant directed towards new hometown hero Roy Halladay in Game 5? It was especially odd to see Burrell complaining about a strike call since it has appeared all series that he had incriminating photographs of the home plate umpires. How many times has he taken what appeared to be strikes and then confidently trotted down to first instead of back to the dugout? And, his big double in Game 1 never should have happened since he was already out on strikes— at least once in that at bat. What happened to last year's NLCS batting hero Ryan Howard? He is too good to have zero home runs or RBI in the 2010 postseason. It makes you think of what the late Richie Ashburn used to say, "Somebody's going to pay." Along the same lines, it stands to reason that Chase Utley, Shane Victorino, Raul Ibanez, and Jimmy Rollins are ready to bust out along with Howard. It has to happen sooner or later, doesn't it? J Roll has surely been flirting with it. 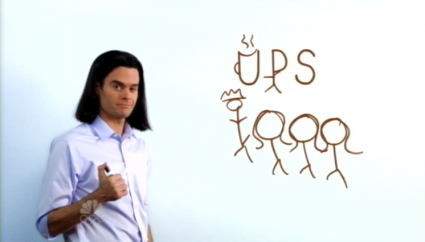 Was Tim Lincecum the artist with lady hair on all those commercials UPS used to run? If not, maybe it was his dad. Speaking of Lincecum and Burrell, did their classless trash talking tirades in Game 5 ignite a spark within the Phillies clubhouse? The Texas Rangers ALCS clinching win last night sets up the potential storybook script that would have World Series TV ratings skyrocketing should the Phillies advance. It doesn't get any better than a Cliff Lee versus Roy Halladay opener. Now, the Phillies just need to win a couple games and Halladay needs to make a quick recovery. in Game 1 and Wally Bell had the treacherous "Whack-A-Mole" zone in Game 4. Phillies fans need to be prepared to unleash their best Burt Hooton/CC Sabathia greeting when Jonathan Sanchez takes the mound tonight. The young lefty has enjoyed a breakout season, but has had considerable difficulty settling in during the opening frame. A deafening, anxiety inducing environment might prime the pump. Regardless of his stats and success, I wonder if Giants closer Brian "Fear the Beard" Wilson's act makes Phillies fans appreciate Brad Lidge that much more? Wilson seems to work extra hard at being bizarre. The Phillies deserve credit for not over-reacting and staying focused with the plethora of balls thrown at hitters by the Giants pitching staff. A number have connected with various body parts while many more have been aimed squarely at batter's heads. Matt Cain displayed pin point control when he wasn't aiming fastballs at the head or other body parts of Phillies batters. Lincecum seemed to take a page out of Cain's playbook with some similar headhunting tactics in Game 5. Winning is the only priority for the Phillies, but it might be nice to see some Giants similarly eat some dirt along the way. Considering Cain's tactics in Game 3 and his previous lack of success against them, the Phillies would surely welcome the opportunity for some sweet revenge against him in a Game 7. Although he has gotten better, Fox broadcaster and former Steve Carlton caddy Tim McCarver still seems intent on making every telecast into a Little League instructional clinic. It would be interesting to be at the Yankees spring training next year when Cliff Lee sees Steve Swisher for the first time. Jose Contreras has been a great bargain basement pickup for the Phillies this season. Besides "The Big Three," Contreras and Madson evoke the most confidence when I see them take the mound. Any takers for Danys Baez so the Phils could afford to resign the hulking Cuban right-hander? To his credit, Baez has put aside any personal disappointment of not being included on the postseason roster and remained a positive influence in the clubhouse. If he remains on the club next season, perhaps this year's experience will further motivate him to harness his greater potential. Will Bruce Bochy elect to return Pablo Sandoval to the bench after his shaky performance in the field? That would be fine with me as, despite a down year, he is still one of the Giants scariest hitters. Who would have known that an aspiring rodeo clown could create so much anxiety for an entire city? Thursday night, Jayson Werth clubbed his 13th home run in 43 postseason games, including 7 last season. He also gunned down Codeo Ross at third base to deflate a potential rally. Letting him walk via free agency would leave a very large hole in right field and from the right-side in the lineup. The Phillies need to find a way to keep him…I'm just saying. A mark of a great team is its ability to overcome adversity to achieve success. The 2010 Philadelphia Phillies have surely faced an ample portion of challenges this season with a disabled list transaction report that reads like an MLB "Who's Who" list. The team has already proved to be tremendously resilient by turning a two-games over .500 mid-season record into the best record in baseball with a remarkable 49-19 finish. While many were contemplating writing off the season as a year of bad fortune, the entire Phillies organization remained resolute in their capabilities and optimistic for a successful outcome. No one panicked, no one baled. After trailing the Atlanta Braves by seven games just a couple months earlier, the Phillies won the NL Eastern Division going away. Their season ending tally of 97 wins and a rare as Halley's Comet NL All-Star game victory gave them home field advantage throughout the postseason. With the "Big Three" anchoring perhaps the best lineup in baseball, odds-makers pegged them as the favorites to win it all heading into the October tourney that spills into November for each league's best team. Although they looked a little rusty in spots, the Phillies quickly dispensed the Cincinnati Reds 3-0 in the NLDS. As further validation to the oddsmakers, the "Big Three" produced a historic no-hitter in the opener and a brilliant five-hit shutout in the series clincher. The team's next destination was a third consecutive trip to the NLCS, this time to face the upstart San Francisco Giants. Somewhat surprisingly, that trip found them in a 3-1 hole after four games and facing the possibility of a winter of wondering what could have been. The Phillies were on the brink of elimination. It has turned into a potential microcosm of their whole season. Of course, for that to happen, the Phillies would need to battle back to win the NLCS. On Thursday night, the Phillies took one large step in that direction. A 4-2 victory over two-time defending Cy Young winner Tim Lincecum in enemy territory kept them alive and restored home field advantage. Somewhat fitting to their seasonal journey, the Phillies' ace of aces, Roy Halladay suffered a groin pull early in the contest and clearly did not display his typical dominating stuff. Also, fittingly, he battled his way through to maintain a narrow 3-2 lead after six innings. And, perhaps keeping with the script, Jimmy Rollins finally seemed to shake off a lingering hamstring injury that has compromised his running ability through the playoffs. 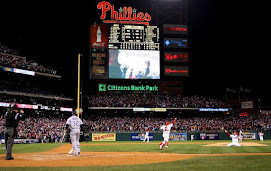 In the seventh inning, seeing J Roll steal second and third base had to hearten his teammates and Phillies fans alike. The bullpen came up big with some of its best work all season over the final three innings. Additionally, Jayson Werth provided a huge insurance run with an opposite field homer in the ninth. Earlier in the game, Werth gunned down Phillies nemesis Cody Ross at third with a Dave Parkeresque frozen rope from right. Besides helping Halladay escape a jam, the play may have taken a little edge off Cody's magic over the Phillies. Of course, two more large challenges remain if the Phillies want to be the first National League team in 66-years to appear in three consecutive World Series. Tonight, Roy Oswalt takes the hill in hope of advancing the team to game seven. 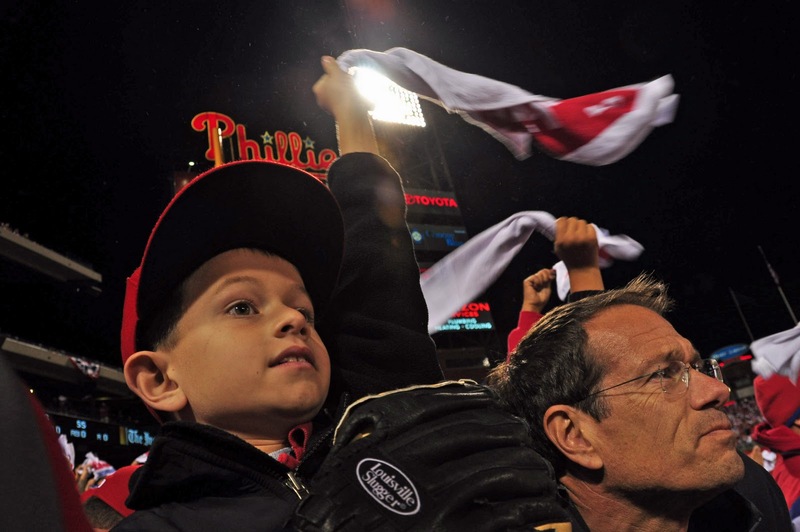 A revved-up Citizen's Bank Park crowd will be there to offer ample encouragement. Should the Phillies win, 2008 postseason hero Cole Hamels is waiting in the wings for Sunday. By then, the electricity at "The Bank" might be enough to power the entire Tri-state area. Meanwhile, Cliff Lee and the Texas Rangers will be looking on, awaiting their 2010 World Series opponent. The stage is set. Opportunity knocks for the Phillies to show their true greatness. After fighting their way through adversity all season, a similar course in the postseason would provide further evidence that this is truly a great team. Coming back from a 3-1 NLCS deficit to prevail would only serve to enhance the argument. It won't be easy facing a Giants team with its own talented pitching staff and a seemingly unending arsenal of interchangeable parts. Importantly, they also possess a belief that they can win. With due respect to the Giants, the Phillies also possess that same belief. This Phillies team is, in fact, a truly special club— and this weekend could go a long way towards demonstrating that further. There is no doubt that the Philadelphia Phillies have struggled to hit this postseason. And, the San Francisco Giants deserve a lot of credit for their strong pitching and overall 25-man team play. Those truths cannot be denied, but ultimately some bad decisions could prove to be the Phillies downfall this season. High hopes— justified high hopes at that— for another World Series Championship may have been lost in the rubble of the Giants Game 4 walk-off win. The decisions in question occurred both pre-game and in-game. The Phillies showed some life by battling back a couple times, but ultimately the most regrettable decision came back to haunt them. After the game, Game 4 starting pitcher Joe Blanton described it this way- "We didn't really lose. We just ran out of innings." Perhaps it was this same convoluted math and reasoning that led Manuel to trust the start to a rusty Blanton with his team down 2-1 in the NLCS and arguably baseball's best pitcher ready to take the ball. Although Blanton had been listed as the tentative Game 4 starter, the Phillies probably never attached much likelihood of finding themselves in this position. Confidence ran high that "The Big Three" would provide the upper hand after three games. Unfortunately, someone failed to provide the script to Cody Ross and company. After the Giants greeted the Phillies in San Francisco with a three-hit shutout on Tuesday, it was time to rethink the original plan. Considering that the Giants ranked first in pitching during the regular season and possessed a 2.11 ERA in the postseason, it was reasonable to assume that the Phillies would need to out-duel them to win. The Phillies acquired Roy Halladay to be the team's stopper and provide an indomitable force at the top of the rotation. The organization's sights have clearly been on winning another championship and Halladay was the perfect work horse to lead that effort. The Phillies' series deficit with two more games in the city and stadium by the bay against a Giants team growing in confidence called for a revised plan. It was time to call on Halladay to pitch Game 4 and Game 7, if necessary. It was also time to call on the other two H2O hurlers to demonstrate its "Big Three" moniker in crunch time. All three have had a great deal of extra rest over the past three weeks. And, perhaps more importantly, they have all winter to rest. The Phillies could ill afford to back themselves into a corner that would require Halladay, Oswalt, and Hamels to win out against three talented Giants pitchers. They also could ill afford to further feed the Giants belief that they could pull off a big NLCS upset. Manuel stuck with Blanton, who battled for 4 2/3 innings with what appeared to be batting practice stuff. After a 20-day layoff, the burly right-hander had little juice on his fastball and little precision on his curve ball. He gave the Giants a run in the first by repeatedly bouncing balls in the dirt. He committed a cardinal sin of pitching by walking a badly slumping Andres Torres to lead off the fifth after the Phillies had rallied in the top half to give him a 4-2 lead- who, of course, scored. Blanton's fastball was generally being clocked at 87-88 mph, but dipped to 86 mph in the fifth. With very little movement and little else to fool hitters, it seemed a matter of time before Giants hitters really squared some balls up. Blanton is a competitor, and has a history of solid pitching after the year hits the mid-point. But to paraphrase a famous political quotation— I know Roy Halladay, and he is no Roy Halladay. We will never truly know, but the likelihood of the Phillies sitting even at 2-2 today had Halladay pitched seem pretty high. And, even pitching on short rest, the odds of "The Big Three" taking two of three would still seem to be in the Phillies favor. Once the game started yesterday, the Phillies compounded the problem with some smaller decisions that proved regrettable. With acknowledgement of the club's offensive anemia, it was still a poor decision to send Carlos Ruiz home in the Phillies fifth with Chase Utley on deck. Center fielder Aaron Rowand got to Shane Victorino's single quickly and was in shallow center. In the Giants sixth, Ross keyed a rally by hitting yet another middle-in fastball that the Phillies continue to feed him. As broadcaster Joe Buck commented, the definition of insanity is to continue doing the same thing and expect a different result. Then, Pablo Sandoval roped a two-run double off a pitch that should have never been called. Letter high 89 mph fastballs tend to land in the seats or bounce off a wall. And, most painfully, the decision to call for a Roy Oswalt change-up after pumping fastballs past injured Juan Uribe was a decision that ended in "sudden death" in the contest. Uribe was able to get around on the off-speed pitch enough to lift a walk-off sacrifice fly to left. The decisions have been made and there is no going back. The Giants have a 3-1 series lead and can close things out tonight within the friendly surroundings of AT&T Park. The series is still not over until one team wins four games and this Phillies team will not quit, especially with "The Big Three" lined up to do battle. Even so, the odds are now against them, particularly since the Giants will trot out their own "Big Three" to oppose them. The Phillies and their fans cannot revise history, so the only viable approach is to latch onto the cliches and conventional wisdom such as "taking one game at a time." But still, unless the Phillies can beat the odds, the gnawing feeling will persist for many years to come that it didn't have to turn out this way. Manuel has been a great choice to lead this club and has been a big part of the current era success. It seems that he missed the mark here, though. This Phillies team was positioned better than any team in its long history to win a Championship. A decision not to ride the team's biggest strength, though— its trio of aces— could haunt its stakeholders for a long, long time. Right now, the team and its fanbase are left to hope that Charlie's math and logic prevails. The Phillies simply need to win four games to advance to the World Series— and it does not matter which ones.